Another reason for my lack of activity is we haven’t been cooking many new things lately… but last week we did. We had two nice Asian-style salads in anticipation of summer. And this recipe, in particular, was very nice. It was so delightful, in fact, that I decided to made a grand effort and take a photo of it. 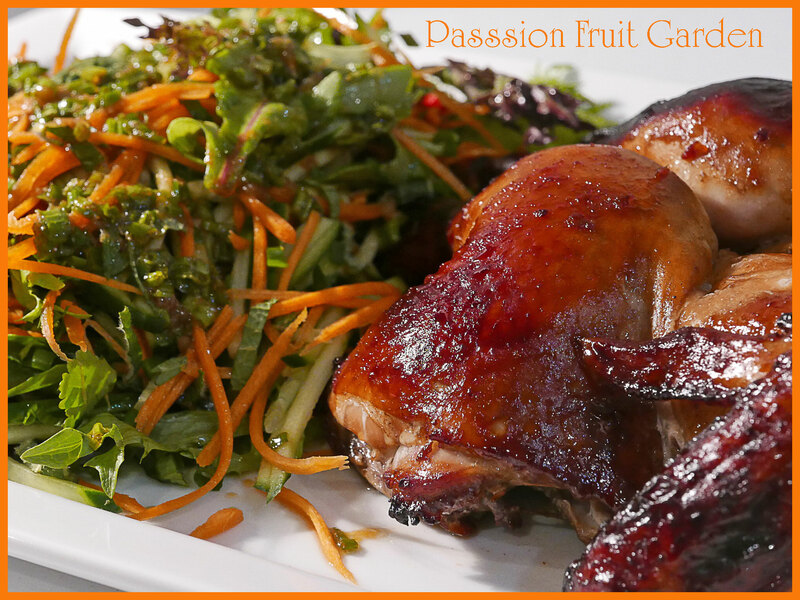 I had never heard of Char Sui chicken before I read the recipe but a quick search on-line tells me it is the style of cooking typically used in Chinese barbequed pork or duck. It produces a sweet, savoury, sticky, glossy barbequed meat. We both loved it and will be making it again. Change the salad ingredients to whatever you wish but do julienne the carrots and cucumber – they just look the part. I prepared them in a few seconds on our mandolin. Also, mung bean sprouts are a fabulous addition. Now it is summer, this is the type of recipe we will be having regularly. It is even flash enough to serve to friends. Do try it. This recipe is from the book, Essence, Discover Flavours from the West Australian Coast by Kirsty Carre and Kristen Watts. and it was perfect. So if you don’t want to buy a whole jar of sauce make your own. *We used two carrots and one cucumber and we had plenty. Cut the chicken down either side of its backbone to butterfly. Combine the kecap manis, chilli sauce and char sui sauce. Brush this mixture over the surface of the chicken, cover and refrigerate for, at least, three hours. Place the chicken in a baking dish, skin side up, and spoon the marinade over it. To make the salad, combine all the salad ingredients and pour over the dressing. This entry was posted in Chicken & Duck, Salads, What's for dinner? and tagged Chinese barbequed chicken by Glenda. Bookmark the permalink. I love reading your blogs Glenda, don’t stop. I have been hearing the blog world is changing sentiment more and more. I think focus on numbers has skewed blogging… of followers and comments, for some. I also began blogging about 7 years ago, wonderfully finding a great community which for me is what blogging is about, sharing ideas, recipes, inspiration. Although I don’t post as much -yet to achieve that irl-online balance I crave, and still read and comment -without that awful obligatory feeling- as much as I can. However, with all things, for others who blog for community, there are swings, and attrition. I love your posts, reading them and other favourites gives me hope to rekindle my own. Getting good local pastured chicken has been problematic for us for a while but it’s sorted for the moment, hopefully ongoing, so it will feature more frequently in our meals (there are four in the freezer!) and this recipes looks delicous. Please keep on blogging Glenda. Yours posts are informative, inspiring, entertaining, and often very funny. It always amazes me how far you go in the pursuit of excellence, especially when you are on a soap-making mission. Maybe we, your readers don’t comment , due to simple laziness ?? I would like to offer a big ‘thank you’ on behalf of all your readers, and one day, if I go to Perth, I would definitely like to meet you and Maus. Thank you so much Denise. I would love to meet you. Are blogs a thing anymore? Do people read them? Very good questions. I know that they certainly don’t comment on them! I’m still reading ; ) Great take on a summer salad Glenda. Did you know you can buy the little Mandarin pancakes in the freezer at the Asian Grocer? You could do salad one night and use the leftovers in Peking Duck Pancakes (Char Siu style) for a snack/entree the next day. Hi Sherry, of course your are right. “If you enjoy it, do it”, is my moto. Merry Christmas to you too Sherry. Glenda, please keep on with your wonderful posts as I always look forward to them. Yes, I care! Please keep posting. I love those sorts of salads, so will definitely try this one. Hi Jenny, I love them too. They are so tasty and good for you. It sounds yummy. I need to get more hoisin sauce. Hi Susan. We always have it in the fridge. It is a pretty standard Chinese ingredient here.